ST. GEORGE –Republicans convened at the Gardner Center of Dixie State College of Utah for the Washington County Republican Nominating Convention on Saturday. It was an enthusiastic full house; over 600 seats filled and “standing room only” overflow. The party’s secretary announced that 456 county delegates were present, representing a 94 percent showing. Three nominations were made by acclamation because those candidates are running unopposed. They include Rep. Don Ipson, incumbent for Utah House District 75, Rep. Lowry Snow, incumbent for Utah House District 74, and Sen. Stephen Urquhart, incumbent for Utah Senate District 29. Two nominations were made by vote, resulting in the nomination of Jon Stanard for the new Utah House District 62 race, and incumbent Alan Gardner for the Washington County Commissioner race. 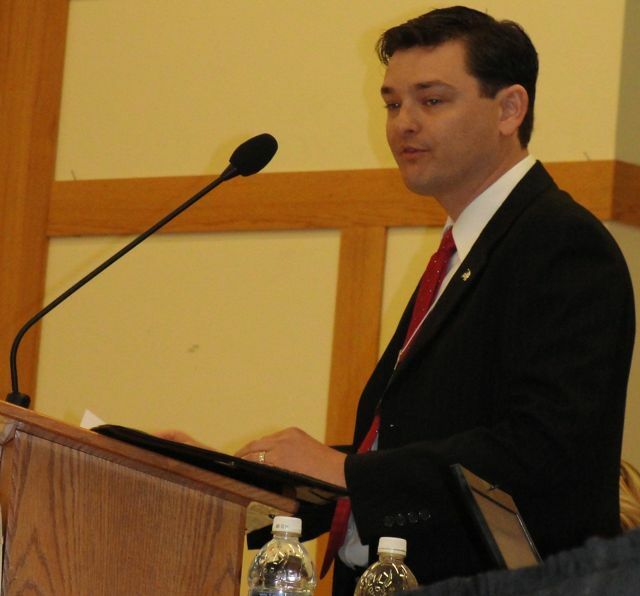 Candidates for nomination at the State Nominating Convention, which will be held in Sandy on April 21, also spoke at the convention. See our sequel to this article for report on those addresses. 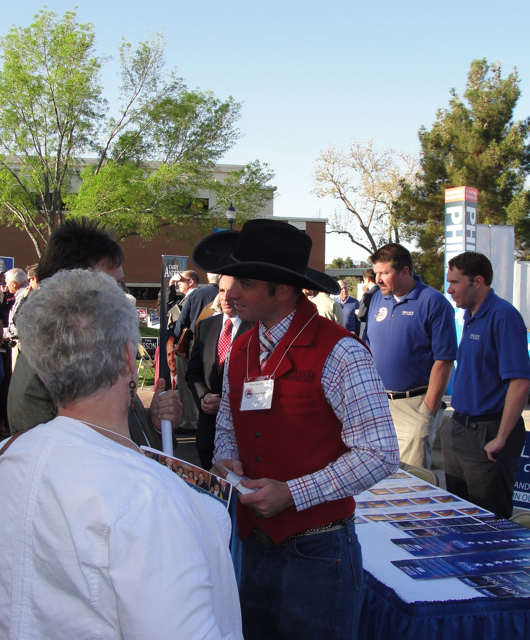 The social assembly began at 7:30 a.m. when all candidates, seeking nomination at both the county and state levels, manned booths and engaged in conversation with delegates and public alike. The chairman proceeded to introduce current politicians in attendance, all of which received applause but none like Sen. Mike Lee. Lee was the standout favorite of the day, then and in his address later on in the convention, receiving standing ovations and cheers. • The party’s caucus attendance goal of 100 people for each precinct was achieved in many precincts. In 2010, the Republicans saw 4,000 attendees at their caucus, and this year they had 7,000 in attendance, representing a 75 percent increase. He contrasted that to the publicized 300 percent increase in Democratic Party caucus attendance over the same timespan, espoused by Dorothy Engelman (Chair of the Washington County Democratic Party), noting that it only represented 300 attendees total this year. • Over 6,000 vote-by-mail registrations have been made as a result of the party’s determined campaign. • Fundraising goal for Washington County Republicans to help in the forthcoming elections is $100,000. Donations may be made through the party’s websites, via precinct officials, and at the Convention as jars were passed around. By later in the morning, an additional $2,042 had been raised. Vice Chairman Shauna Jo Larkin then opened the podium to the candidates, allowing a strict three minutes each. There were four vying for the new House District 62 nomination: Mary Burnett, Austin Anderson, Mike Heaton, and Jon Stanard, and it was a close contest. Heaton, who resigned his position as Legislative Chair earlier this year in order to make this run for the House, was knocked out of the running in the first round. Burnett, Anderson and Stanard continued into a second round of voting, in which Burnett was eliminated. Stanard led with his endorsement from Lee, an endorsement which likely carries weight judging from Lee’s reception at this convention and the final tally. Stanard said he felt he needed to take action as he saw the federal government overspending and overreaching. He talked about reading bills and asking himself if they are needed and if we can do without them. On final vote, which was recounted for verification, Stanard took the nomination over Anderson by one vote. Stanard proceeds to campaign against Democratic candidate Brent Holloway for November election as the new House District 62 representative. There were three vying for nomination for commissioner: Greg Aldred, Alan Gardner and Slade Hughes. Aldred, who offered endorsement by the Utah Tea Party, and Hughes, who said, “I am not a professional politician,” were out of the running with the first vote. Gardner, whose platform was on his record as incumbent, received over 60 percent on first vote and took the nomination. Gardner proceeds to campaign against Democratic candidate Chris White for November election as the new Washington County Commissioner. 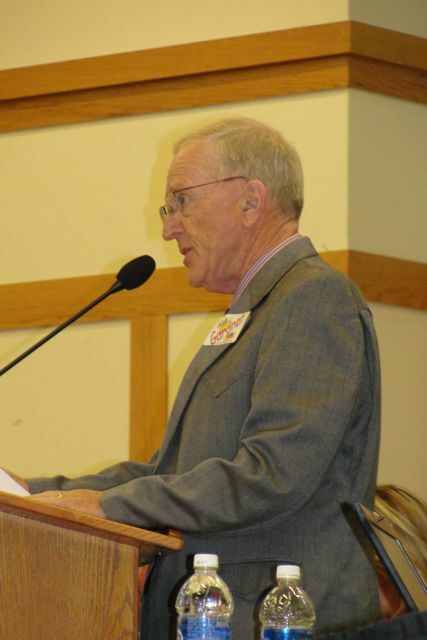 Those advancing their spirit for America and the Republican party included Lee and those seeking reelection and party nomination at the upcoming State convention on April 21. They include hopefuls for Republican National Committee, Governor, U.S. Senate, U.S. Congress, State Attorney General, Auditor, and more.